Muskegon, Michigan, USA...Kaydon has released versions of its Applications Guide in both Spanish and Portuguese, to better serve its customers around the world. 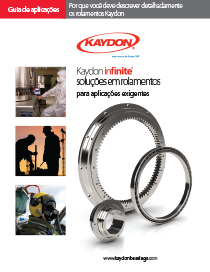 The 8-page guide describes the key capabilities of each style of Kaydon thin section and slewing ring bearing. A comprehensive chart lists a wide variety of applications by industry, and indicates which Kaydon products (thin section bearings, slewing ring bearings, roller bearings, and WireX® bearings) meet the needs of the given application. For additional specifications, performance data, ratings, detailed application guidance and more, visit our downloads page.